Good afternoon, everyone. It’s full steam head toward a wintry mess later tonight into Monday. 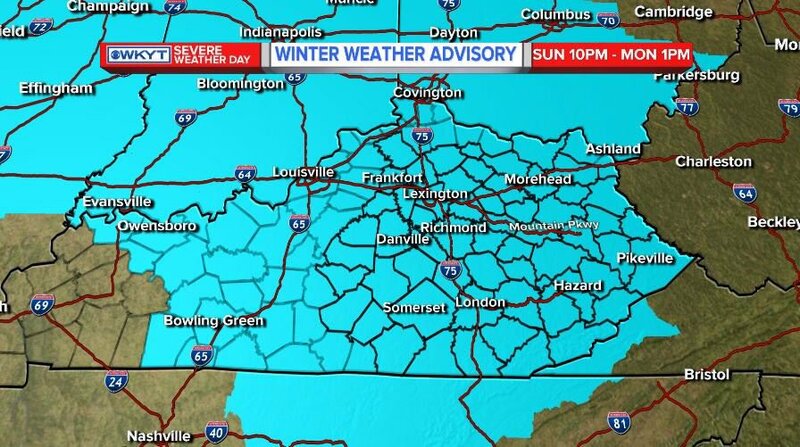 A combination of freezing rain, sleet, snow and rain will move across Kentucky, and falling onto a frozen ground. That will create widespread travel issues. For our neighbors in West Virginia… No excuse for that not to be expanded into your region. None. As precipitation falls into that dry air, it initially evaporates and cools the temps. Readings will quickly drop below freezing. That, in conjunction with a frozen ground will make for an icy mess later tonight and Monday. Let’s look at the model trends and see what we can find. If that verifies, some minor power problems would be noted, especially from the Lexington metro to the Louisville metro. If you’re going to be traveling late tonight into the first half of Monday, please be aware we are likely to have a significant travel impact across the region. I’ll drop back for another update later this evening. Have a great Sunday and take care. At least here Pennsylvania At least it will be all snow. I hate to deal with ice. Everyone back in Kentucky becareful out there. Like I said I live south of Erie and have dealt with alot of snow and was wishing for the snow to melt but it probably won’t be til April before that happens.Becareful while you drive tommorow. I will enjoy the warm mid week weather. Not looking forward to the cold rain follow by backside flurries next weekend. So true….just an awful winter-to-date. Ice cold with absolutely nothing to show for. Even less snow in Harlan this season compared to last year through today’s date. Charleston NWS is notorious for waiting for an event to start. But I think this time they are going with past trends. Meaning as is usually the case here the moisture wont arrive until after the temp tops freezing. Which will mean a total rain event. Just like the late week system will be all rain save for the dreaded backside flurries. I think you and Chris B. made their ears itch up at the Charleston NWS–they finally issued their Winter Weather Advisory for the Charleston/Huntington, WV forecast area at 2:53pm this afternoon…in fact, maybe they were just waiting to see what Chris had to say before making the call! It’s ridiculous to not let people know it’s gonna be a skating rink out there tomorrow morning, especially if it affects the morning work commute. Not defending NWS Charleston, but they have at least included Kentucky and Ohio counties going into effect starting at 4a Monday. I’m sure the next forecast cycle will have the rest of Charleston CWA included as they do believe it is likely an advisory will be issued. Perhaps a change in timing, like 7a start time for them instead of the 4a start time to their west? I would say the pattern has made a change since yesterday. The Gulf of Mexico is now open and moisture is flowing northward into the central plains. The chances for a major snow event have really increase for this winter. Next weekend looks interesting for the Ohio valley. Willing to bet the air will be too warm to support anything beyond a slight mix and a lot of cold rain. If the ground were frozen, we would probably have ice, but should be warm ground as the moisture moves in. Seems CB is destined this winter to talk about cold air, mix and spring-like storms later this winter. I like the next weekend setup if the models are reading right. Remember back in March of 94 the temps hit 70 degrees that was follow by a snow storm. It did it back to back weeks I’m just wondering this is a similar setup we’re gonna experience next weekend. Time will tell. Temperatures in central KY running several degrees warmer than forecast for this time of the day. Maybe this limits the amount of frozen precipitation tonight and will help warm road surfaces as well. I’m hoping for enough snow to cover the ground but am becoming more doubtful about even that. I guess the “concern” of warmer than forecast temps is a busted forecast? Actually, they are referring to more cooling and more chance for ice. Kind of CB has mentioned. That said, cold rain and nothing else would not be bad. Mix and ice is only good for bad stuff anyway. Evaporative cooling is a recipe for ice..Cools the air..Dewpoints will increase and temps will drop..
Chris, what time do you think this will all start? We’re finally getting to the pattern to get moisture from the gulf that will give us a better chance of snow. We shall see snow lovers. Someday guys you gonna eat your words. This snow drought will end some day. Kentucky does get it’s share always have since I live here since 1960. We already had big snows two years ago. From a time standpoint and weather, two years is a tiny spec. Current trends though are siginificant, since the outlooks for snow have missed every time in the past two years. No Threat Mode from CB for last winter and this one so far. My bet is big snow will not be our issue this winter. We shall see snow, snow lovers. You folks have short memories.. The snow drought was busted in 2015 when we had multiple crushing snowstorms followed by the coldest temps in decades. Yeah, last year and this year so far have been snow free but I wouldn’t call it a snow drought. I call it a snow drought none last year and so far none this year. Temps are jumping here in Frankfort, 46 degrees and climbing, can’t see this being much if anything event. Agree; temps have definitely “creeped” above freezing here in Lex at 42 with sunshine. Feels like spring after the past two weeks. Will we ever get a decent snow in South Eastern Ky?! Snow starved…that’s me! 42 in Louisville. Higher than predicted. 41 here currently in my area of Louisville (though the thermometer on my deck reads 38) and the sky certainly has that grey look of incoming weather. Correct me if I’m wrong, but I’m seeing a lot of comments about how this looks to be a “non-event” because of the temps over-achieving (although the high here today was 42 and that is what it’s been)… um… isn’t that exactly what we didn’t want to see? My understanding is that the warmer it is higher chance to see more ice. No amount of slightly warmer temps today was going to warm the ground enough to prevent freezing on impact… heck everything here that’s frozen is still completely frozen. Maybe I’m just confused, but I thought it was better if it stayed a little cooler today. I’m no expert, but I think you have a good point. I live in Louisville also, very close to the Oldham county line. The NWS temp for my area is 40. My outdoor thermometer is cooler too. We shall see what happens overnight I suppose. The good thing is this should not be an ice storm where trees and power lines are damaged; more a pavement icing. It will be interesting here in the morning for sure. If things freeze up overnight like they suspect all eyes will be on JCPS. I didn’t see crews out brining this afternoon anywhere my end of the city. That may mean road surfaces are too cold, if anyone knows? Made it to 40 today which is what was forecasted by my local weather. 42 in Lexington today. Felt amazingly warm! Grilled out some ribeye steaks, and went for a walk in the arboretum. What is amazing, that is right on the normal high for this time of year!! Must be something to it. Schools in SW West Virginia are battening down the hatches…lol. Already down to 26 here.